Note: We are over 100% of our goal, but we can continue to receive pledges of any amount until 9pm on Friday the 30th! Every dollar pledged will directly support our farm and farmers. There are still over 1,000 hours of labor that have gone uncompensated, and many outlying infrastructural needs that go well beyond the budget of $15,000 (this is just one third of our total budget for 2012). THANK YOU!!! Like us on FACEBOOK; Follow us on TWITTER; Sign up for the newsletter on our WEBSITE! We are a non-profit organization: All donations to this project are tax-deductible! Sprout City Farms, in partnership with the Denver Green School, Denver Urban Gardens, and Denver Public Schools, is building a one-acre vegetable farm in a corner of the schoolyard at the Denver Green School (DGS). DGS is a public elementary and middle school (pre-K to 8th grade) focused on environmental and social sustainability through a "hands-on, brains-on," project-based approach to learning. 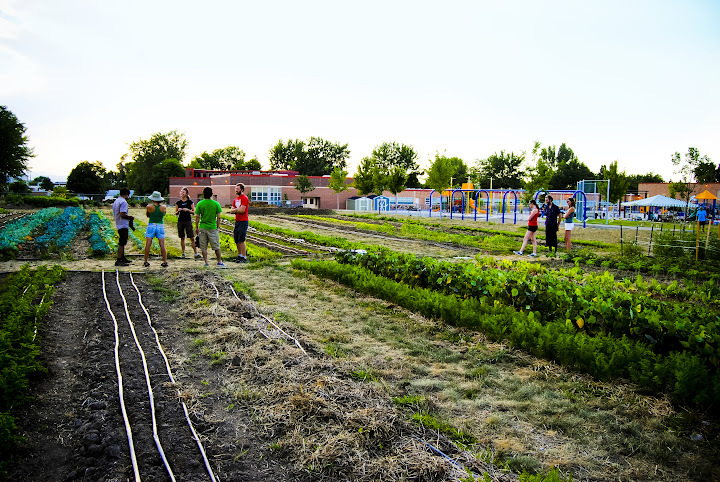 The Denver Green School Community Farm aligns perfectly with the values of the school, providing opportunities for students to engage in the natural world, food production, and interaction with the local community. It also gives them space to run around outside chasing grasshoppers. All produce grown on the farm serves the school and surrounding community. During the summer this season, (our first year, 2011), we are growing for a 40-family CSA (Community Supported Agriculture) program, where members purchase shares of the harvest and come to the farm once a week to pick up their produce. Participating CSA shareholders are parents of DGS kids, DGS teachers, and neighbors of the school. In addition, several low-income and refugee families benefit from sponsored CSA shares. During the school year, we are selling produce directly to the school cafeteria so students can follow it all the way from the field and enjoy it in the lunch room. 50% of students at DGS participate in the Free/Reduced Price Lunch program and may not have access to fresh, organic produce at home. Sprout City Farms is offering a summer internship program (4 interns this year), volunteer days and community events, and is also developing farm-based educational programs for youth and adults alike in conjunction with DGS and Denver Urban Gardens (DUG). Just over the fence from the farm is a school and community garden managed by DGS and DUG, where students and neighbors tend their own plots. Nice Farm. Why do you need our help? Sprout City Farms is currently a volunteer-based organization, relying on income from CSA shares and grassroots fundraising to convert the former grass field to an acre of organic vegetables and herbs this spring (2011). We are still building the farm, and need further funding to complete the project. Supporting our community events and educational programs. Continuing to have a thriving farm for next year! The first of its kind--many more to follow! Our goal is for the Denver Green School Community Farm to be a pilot project--the first of many school and neighborhood farms--and with your help we can complete construction of the farm, grow our staff and programs, and continue to work towards making this goal a reality. Developing this school farm model will help us replicate it successfully around town, and spread the word to other school districts in other cities. Please support us in rooting farmers in the city and bringing good food to schools and neighborhoods! Seed packets from local Colorado seed purveyors! Recipes for farm-fresh veggie dishes from our community! One of our favorite farm/garden/cook/books! Invitation to tour the farm with SCF farmers and DGS students, and a fruit tree named in your honor (to be planted on the farm in Spring 2012)! Invitation to tour the farm with SCF farmers and DGS students, a fruit tree named in your honor (to be planted on the farm in Spring 2012), and complimentary VIP entry to all of our events in 2012!